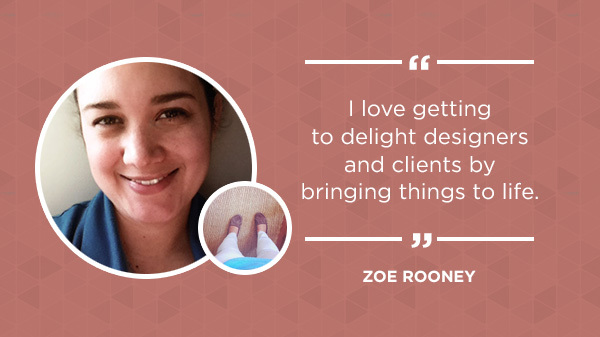 Zoe Rooney is a freelance developer based in Philadelphia and you may be familiar with her work: Zoe has built beautiful sites for the likes of Blogshop, Everly, and Ban.do. If you haven’t seen it, you should definitely go check them out! We sat down with Zoe and asked her some hard-hitting questions about what she does, why she loves it, and what she would say to anyone out there just learning to write HTML & CSS. I’m a front-end developer, and I have the great pleasure of working with a number of extremely talented designers, as well as directly with select clients who have an eye for design. I currently spend most of my time building custom WordPress and Shopify sites for clients who work in design and lifestyle blog/ small creative business niches. As a former educator with a degree in art, I love that my job allows me to do more than just code (although coding is my favorite): I also get to exercise my design skills as I translate websites from mockup to live site, and I get to help clients and designers get to know the ins and outs of how the web works. It’s basically awesome all around. My website is one part portfolio and way for people to submit project inquiries, and one part repository for information that no longer fits in my brain (that would be the blog and the Bookmarks page). It’s built on WordPress, with a custom theme (of course), a bunch of plugins, and a number of various customizations that are always evolving and changing since I tend to use it as a playground for features and technology that I haven’t yet had the opportunity to work into client projects. I’m pretty bad at designing for myself so I hired Meg Lewis from Ghostly Ferns to design it for me and I just love the result. Like many of my contemporaries, I started playing around with code back in the Geocities days (roughly middle school for me), and just built slowly from there. I started doing freelance design & light development work in college, and then came back to it a couple of years out of college after taking a few years off to do other things. I’ve been freelancing steadily for a couple of years, and went full-time with my business in July 2012. 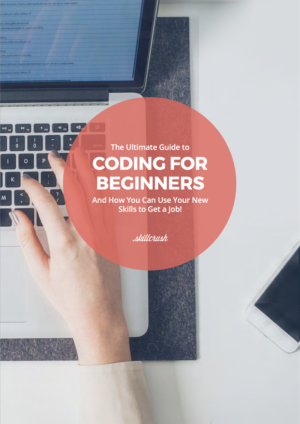 What would you say to women who have just started learning HTML & CSS? We need more of you in the field, so thank you for taking those first steps! Also, I highly recommend finding local groups that do in-person learning experiences – I think you’ll probably learn fastest if you combine all the online learning options (like right here on Skillcrush) with in-person help and instruction. I’m involved with the local GirlDevelopIt chapter, and am constantly amazed at all the amazing workshops they’re putting on as well as at the caliber of both the instructors and the attendees. What do you like about front end development and design? I love getting to delight designers and clients by bringing things to life just like how they’ve imagined them. I’m also a huge fan of puzzles and problem-solving, and to me that’s what front-end development (all development, really) is about. I especially like focusing on development because of all the amazing people I get to work with on the design side. To put it succinctly, I think good design is creating beautiful ways to solve problems and reach goals. There’s some other stuff about being enduring, and actual technique, but I think if you’re focusing on the goals and also reaching for beauty at the same time, you’re moving in the right direction. What applications do you have open while you’re working? I’ve written pretty extensively about the apps and tools I use in my workflow, but the main ones I have open almost all the time are Helpscout (a support ticket/ email system that allows me to handle conversations in partnership with my assistant super efficiently), TeuxDeux, Fantastical, Espresso (my favorite text editor & FTP client) and of course Photoshop. I don’t know that I’ve ever received a particularly notable single piece of advice, but I’m constantly thankful that my mom taught me the value of really hard work and being passionate about what you do (mostly by example).